Raising children in a Military family has its challenges. It is nice to come across anything that can help in that journey. Books are a great resource for children in the Military. 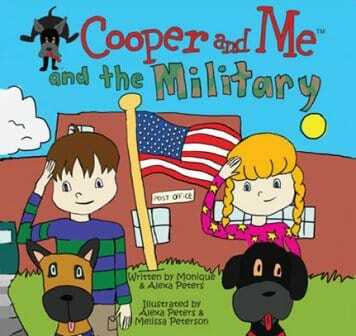 I was given the book Cooper and Me and the Military by Monique and Alexa Peters to review. Cooper and Me is a children’s book series was started by a young girl, Alexa Peters (now 13), who has always loved to write stories and draw pictures about her experiences as a means of expressing her feelings. Cooper and Me grew out of Alexa’s gift for storytelling and compassion for other kids. The mission of Cooper and Me is to both entertain young children and help them gain emotional resilience as they navigate the challenges of everyday living. Alexa Peters (age 13) was inspired to write a story about family friends who were separated by deployment. She wanted to write this book to help kids process their feelings about loved ones being away from home and honor those in service. As soon as I took the book out of the mailer I knew I was going to love it. The cover is bright and has some pretty cool illustrations on it. The story is interesting and I think a lot of Military children can relate to it. My son said it was “cute” and enjoyed it. I also really liked that at the end of the book there were questions I could ask my son about it. One of them was “Have you ever missed someone? How does that feel?” I thought it was a great way to connect with your children through the book. I know we plan to check out other books in the Cooper and Me series! I am getting married in April to an Army man. I would keep the book for our slowly growing family library. I would love to add this to my daughter's library. I have two grandaughters under the age of 3 and a new grandaughter due in May…. if I don't win, I plan on purchasing this book for them. Thanks for the review!